It might be useful. I have arthritis in my thumbs, and when it’s in full flair, a can’t hold anything with my left hand to cut it with the knife in my right hand. I’ll consider it. I’ve looked at it more closely on Amazon, and I decided to order it. I would probably have trouble using the little tab on the bottom to hold on to it, but I think I could manage by putting my hand on the top on the side away from where I’m cutting. I don’t think this is a Unitasker any more than a knife is. All a knife does is cut things. 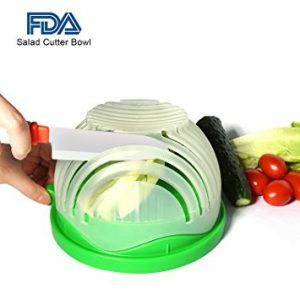 It seems you could use this to assist cutting any number of things, and for some it could probably replace a standard cutting board. Intrigued by the idea, especially since it might reduce mess and waste by confining what you’re preparing to the area under that dome. However, if your knife isn’t long enough, I’m guessing things inside might slide around a bit as you try to cut through; and small round things might skid away from the blade. I bought this a few months ago after seeing it here. It is the perfect size for washing berries for breakfast, green beans or broccoli to microwave for lunch salad, and mushrooms for dinner. The plastic undersurface protects counters from water marks.